Fort Yumans finally had the opportunity to get their hands dirty again recently during the repairs of the Crossroads Mission kitchen. 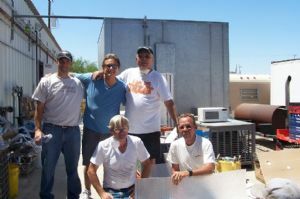 With the help from Rotary District 5500 in the form of grant money, Fort Yuma made a substantial contribution to the Crossroads Mission's kitchen remodel. Fort Yuma contributed $2,000 and the district matched that for another $2,000! What an opportunity this was to do something for the Yuma community and the people that the Mission serves. Remember that grant money is in part, money that is returned to our club that was given three years prior through your foundation giving's. Good job Fort Yuma and thank you to all who showed up to work that day. I'm not sure who you all are but if someone would provide me a list, I will be glad to give you credit in print. You deserve it!